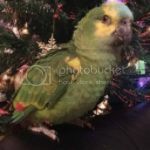 Parrot Forum • View topic - STOP CLIPPING!! Last week I went to my local bird fair/show and saw a disturbing sight. Nearly every bird there was clipped! In total, I only saw one too and one gray that were fully flighted, as well as the canaries/finches. There was even a gray with the secondaries clipped, and that gray was a plucker!! The gray fell like a rock onto the table when he attempted to fly and never stopped flapping his wings at every small movement of my hand. One breeder there clipped the baby tiels and lovies before fledging. Their tail and flight feathers were still coming in, yet a few primaries were already clipped! These birds will probably be handicapped for life and will never learn to fly. These babies hadn't even attempted their first flight yet. This is a reminder to everybody, DON'T CLIP!! Birds are meant to fly, and depriving them of their main way to get around is cruel. There are so many problems caused by clipping, from balance issues and not feeling confident to lack of exercise. Please never get a bird if you are not prepared for a flying animal in your home, because the bird will just end up clipped or caged all the time and will never get the chance to truly be a bird. Wing clipping is always done as a matter of convenience or out of ignorance. 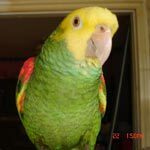 Whenever people say it is for safety, it is either because they don't understand how to keep a flighted parrot safe or because that effort would be too inconvenient. On the other hand, this is ignorant because they fail to realize that even clipped parrots end up flying away, falling into water, etc. I Myrtle had been clipped when the wind sucked her outside she would have been blown away and I probably would never find her again. Rainbow has never flown. My daughter had her outside when the wind kicked up and he flapped with it. I was on my way to the store and saw a yellow head fly into my neighbors yard. I pulled in her driveway thinking that it was a lost "fly away" bird until I saw Rachel running after her. Gimpy is a bird with a missing leg and the other one is so twisted he can only use the foot to hang onto things. He came to me clipped. The person who did that was lucky I did not know who. The poor thing was so fat because he had no form of motivation. When his wings grew back he became a different bird and loves to fly. Trick or 'Tiel wrote: Last week I went to my local bird fair/show and saw a disturbing sight. Nearly every bird there was clipped! In total, I only saw one too and one gray that were fully flighted, as well as the canaries/finches. There was even a gray with the secondaries clipped, and that gray was a plucker!! The gray fell like a rock onto the table when he attempted to fly and never stopped flapping his wings at every small movement of my hand. One breeder there clipped the baby tiels and lovies before fledging. Their tail and flight feathers were still coming in, yet a few primaries were already clipped! These birds will probably be handicapped for life and will never learn to fly. These babies hadn't even attempted their first flight yet. This is a reminder to everybody, DON'T CLIP!! Birds are meant to fly, and depriving them of their main way to get around is cruel. There are so many problems caused by clipping, from balance issues and not feeling confident to lack of exercise. Please never get a bird if you are not prepared for a flying animal in your home, because the bird will just end up clipped or caged all the time and will never get the chance to truly be a bird.